A Mai Tai is a boozy blend of coconut and spiced rum, triple sec, orange and pineapple juices, and a splash of grenadine. Mix up a batch for a taste of the tropics to enjoy with friends and family this summer. When you’re lounging outside in the summertime, it’s easy to imagine you’re in an island paradise — even if you live in New England! And if you really want to feel transported to a tiki bar on a white sandy beach, mix up a Mai Tai for a taste of the tropics. 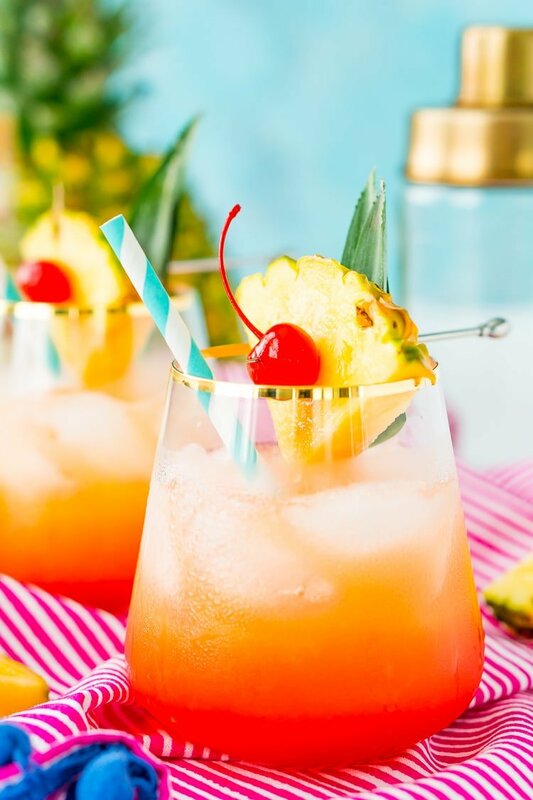 Refreshing, fruity, and spiked with a blend of sweet and spiced alcohols, Mai Tai drinks are fun to sip when the weather is warm and the sun is starting to set. In addition to being delicious, they look like a pink sunset in a glass! What Is In A Mai Tai Recipe? There are always different variations of cocktails, so depending on who you ask or where you order a Mai Tai, you make get different things. 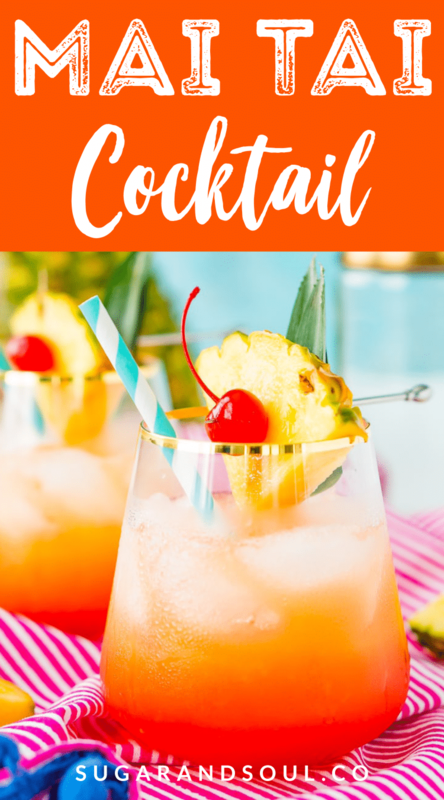 This recipe includes both spiced and coconut rum, as well as orange juice, pineapple juice, Cointreau or Triple Sec, and a splash of grenadine. 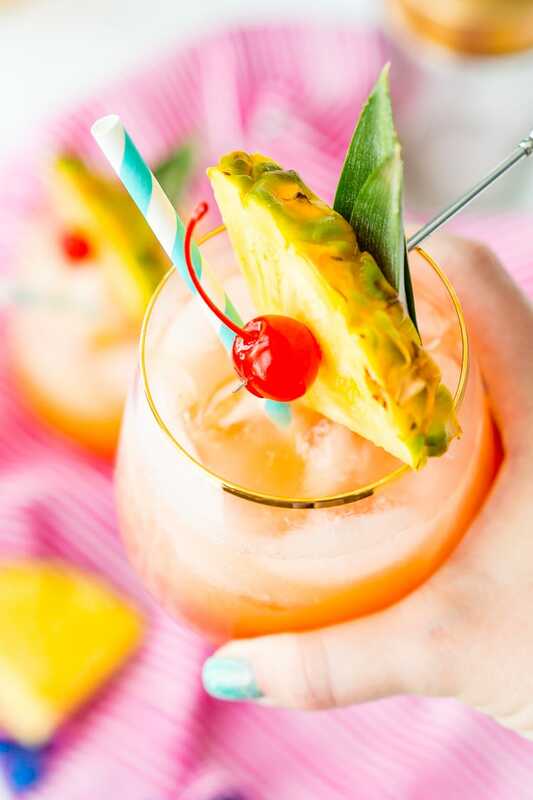 Other recipes might include fresh citrus juices, almond extract, or orgeat syrup, but I like to keep my Mai Tai recipe simple, strong, and fruity! And don’t forget the garnishes, they’re what makes this tropical cocktail so much fun! But drinker beware: this Mai Tai recipe is boozy! Made with both coconut and spiced rum, plus a glug of orange-flavored Cointreau or triple sec, this cocktail certainly packs a punch. 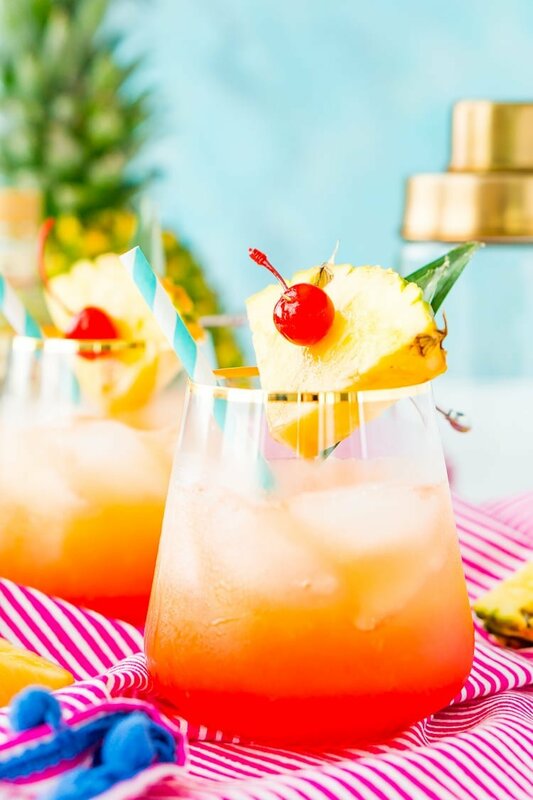 A blend of pineapple and orange juices, plus a splash of grenadine, give this drink its signature fruity taste and summer sky hue. 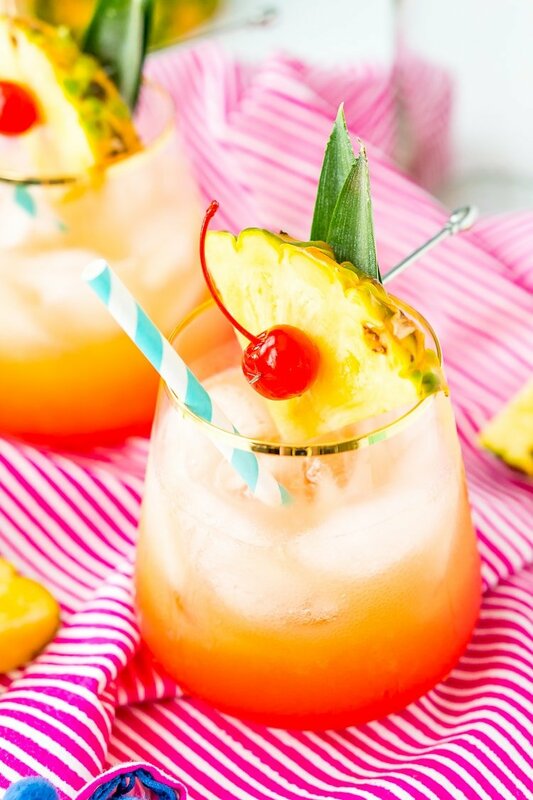 Perfect for parties on the patio, by the pool, or on the deck, Mai Tai cocktails are as pretty as they are tasty! 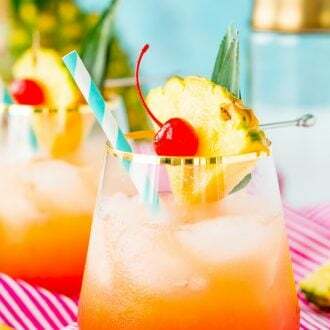 You can have a lot of fun garnishing these drinks with paper umbrellas, plastic swords, colorful straws, orange slices, maraschino cherries, and pineapple wedges. Don’t forget the fancy glasses, and opt for shatterproof ones if you’re partying poolside! The kiddos can also enjoy a taste of island life with a virgin version of this recipe. Leave out the alcohol and blend the fruit juices with a splash of grenadine for the same layered sunset look… and don’t forget garnishes to make it extra special! Summer is the season to enjoy the sunshine, balmy breezes, and epic sunsets with your friends and family. For those outdoor parties and get-togethers, mix up a batch of Mai Tai Cocktails for a boozy taste of the tropics, no matter where you are! Pin this Mai Tai Recipe for Later! Combine pineapple juice, orange juice, rum, and triple sec in a cocktail shaker and shake to mix. Pour into a glass over ice and top with grenadine. Garnish with pineapple and maraschino cherries. This looks like an amazing summer drink recipe! I love everything in it! LOVE LOVE LOVE!! These are a hit with the ladies at the pool! This looks seriously incredible! YUM! Thanks for sharing such an amazing recipe, made it for friends last weekend and everyone loved it!